Had a call from Ellen. She was in a swan-related meeting at Margam, but a swan had been reported as injured at the Cardiff Bay Watersports Centre slipway, at Channel View in Cardiff. The Cardiff Bay Barrage people thought that it had a broken wing, and was in a bad way. It took and hour or so before I could get there, and when I arrived there were a few adult swans and cygnets pottering in the rain at the water’s edge. It was also cold, grey, and piddling down with rain. I wondered which one it was before I spotted a bedraggled white bundle on the grass beside the slipway. When I approached, I thought the poor little bugger was dead, as it made no movement, but when I lifted it’s head the eyes were bright and there was still some life there. There was also no obvious sign of serious injury, although the feathers of the head and neck appeared saturated with water. It put up no struggle as I wrapped it and put it in the car, and a couple of people nearby reported that it had been walking in the road “looking confused” for a few days. Having arranged to meet Ellen and Peter at Cardiff West services, that’s where we ended up a little while later, and a couple of very helpful members of the services staff gave me some tissue to dry the swan and some bread to feed it. The swan had perked up a little in the relative warmth and shelter of the car, but when I tried to feed it some wet bread, there was a problem – head waving side to side violently, and difficulty swallowing. Closer examination of the head revealed a couple of minor-looking injuries at the front and back. 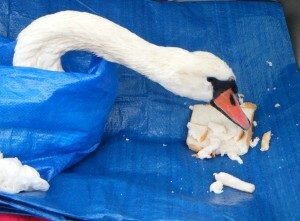 When Peter and Ellen arrived a few minutes later to take custody of the swan, the initial diagnosis was that the damage might have been caused by a territorial dispute, resulting in brain damage. Another thank you for picking up the swan from Channel View when we were in a meeting in Port Talbot. We went straight on to Shepperton with him after we picked him up from you just in case he needed special treatment. He had a bowl of food in with him and we could hear him slurping every now and again – good sign. When we arrived at Dot’s she gave him a pain killer injection and an antibiotic injection and then put him in a quiet place on his own. He soon made it quite obvious all he wanted to do was sleep. She seemed to think he had been involved in a territorial dispute – quite a bad one. She also thought he was elderly but I wasn’t convinced of that. Today he has joined some cygnets in one of the large pens. Hope you can help. I am a resident of Pentwyn in Cardiff. Do you know the small lake behind the leisure centre in Pentwyn just off the motorway? Just came back from a walk there and saw a swan on the lake in distress looked like it had swallowed some fishing line. Hope you can help the swan they are beautiful.